A reminder for those of us traveling by car this holiday – be sure your car vomes with a rear view mirror and a horn. Every car should have them. Hard to imagine there was ever a time when every car didn't, but the mid 1920s was such a time. 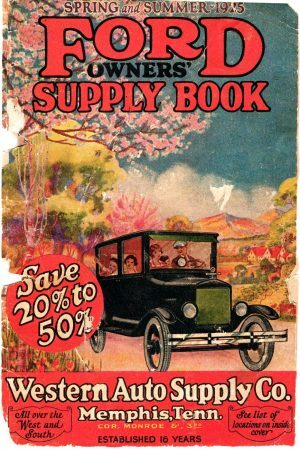 Ford's Model T was so ubiquitous it was just considered a “Ford” – no model number needed. And the Model T (especially earlier versions) was so basic and cheap that rear view mirrors and horns didn't automatically come with the car. Nor did windshield wipers, brake signals, and door handles that locked, evidently. 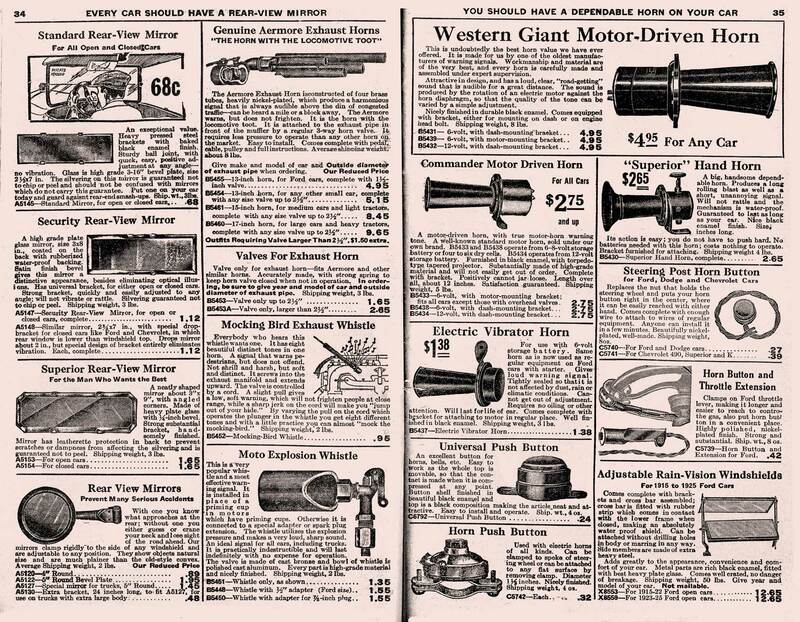 But you could buy all these in the pages of the Western Auto Ford Supply book. 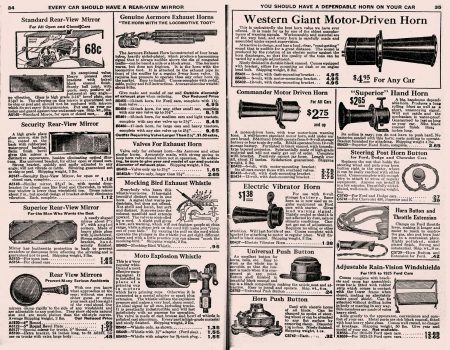 The biggest problem with 1920s cars would seem to be tires, judging by the number of pages and their prominence at the front of the catalog. Not only were there pages of tires, there were tubes, patches, pumps, and “revulcanizers” to keep your flivver flying forward. 1920s roads weren't all that great, and a trip to Grandma's might almost literally be over a river and THROUGH the woods, so lots of tire supplies were a must. And Western Auto would ship any of it to you in one day. P.S. 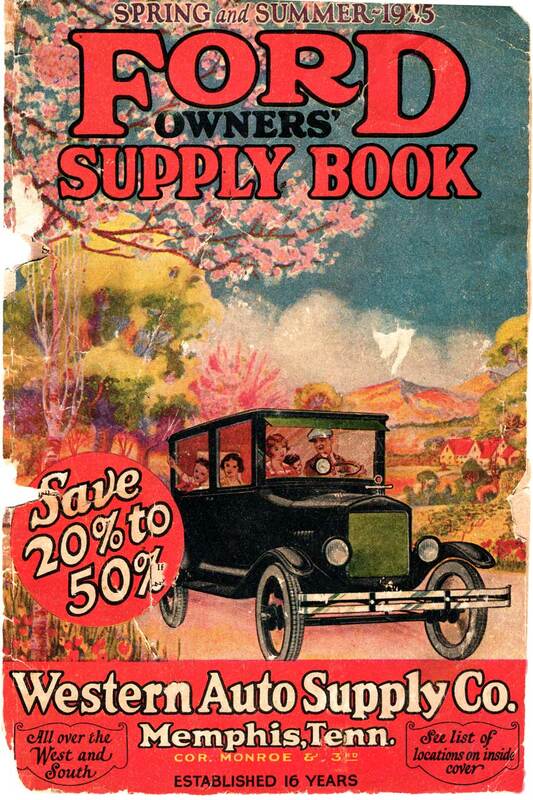 Apologies for the rough shape of cover, but this catalog, unlike the Ford Model T, wasn't built to last.